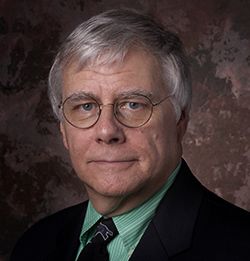 Roddy Wolper, 73, former news director for UNT, died Oct. 10 in Denton. He worked at UNT from 1999 to 2007 as associate director of University Relations, Communications and Marketing and director of news and information. He did everything from serving as spokesman for breaking news stories to writing articles for The North Texan. He was noted for his ability to see things objectively, even writing poetry about current events, and was a mentor to others in the department. Co-workers remember him as a voracious reader who had great command of the written word and an amazing vocabulary and loved his family, friends and animals fiercely. He always said every writer should have a dog named Doggerel. He earned his bachelor’s degree from West Texas A&M University and did graduate work at Texas Christian University. He also worked for Southern Methodist University, Loyola University, SullivanPerkins, the American Heart Association, the University of Dallas and Texas A&M University at Galveston. He often photographed events of the Denton County Democratic Party, which his wife, Phyllis, served as chair. A reception will take place from 2 to 4 p.m. Oct. 21 at Bill DeBerry Funeral Home, 2025 W. University Drive in Denton.